Father Joe’s Villages’ security team members receive extensive training to ensure that they’re prepared for whatever comes their way. This training was put to the test for a new recruit, Officer Ortega, and he stood up bravely to the challenge. At Father Joe’s Villages, our security staff wears many different hats. They each play the role of guardians, psychologists, teachers and even, in some cases, nurses. That’s why our Security Team receives extensive training that covers everything from crisis aversion and emergency protocols to medical evaluations and CPR. Officer Ortega, the Security Team’s newest recruit, found out firsthand just how vital these trainings can be and how any normal day on the job can turn in the blink of an eye. Originally from San Francisco, Officer Ortega has lived in San Diego for two years. 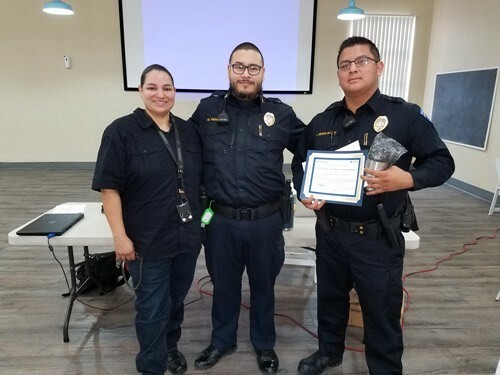 Ortega’s main goal for the future is to join the police force, and he knew working security would give him the experience he needed. He previously worked security at a warehouse on a loading dock where he would check packages in and out. He says his favorite part of working at Father Joe’s Villages is the interaction he gets to have with clients. 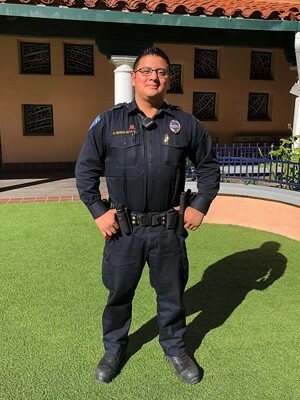 Every day, Officer Ortega learns something new, and just six months after working at Father Joe’s Villages, the day came when he had to put all of his training to work. While on duty one evening in January, Officer Ortega received a call from dispatch stating that a client was lying unconscious in the second floor bathroom of the Joan Kroc Center. As he made his way upstairs, he realized that the situation was a lot more serious than he originally thought. Once in the bathroom, Officer Ortega found the resident slouched against the wall. “All her color had gone away,” he recalls. “She was not responding at all.” He took her pulse and found that it was barely there. Calmly and instinctively, he cleared the other worried residents out of the bathroom, laid the client on the floor and checked for her pulse again. This time it was gone. He informed dispatch what was going on and decided he could not wait for medics. Fortunately, Officer Ortega had taken Father Joe’s Villages’ CPR class just two weeks prior. He knew he had to begin CPR right away. Shortly after the client became responsive, the medics showed up and took her to the hospital for further evaluation. It was a night Ortega would never forget. After the incident, Officer Ortega was granted his “Save-A-Life” pin so he could wear his achievement with pride. He admits he can’t be sure the situation would have had a happy ending if he had never taken the required CPR class. He thanks his in-depth training at Father Joe’s Villages for knowing how to remain calm and act quickly to save the client. Looking for Security Positions in San Diego? Join Father Joe’s Villages’ Security Team! We’re always looking for compassionate individuals to join our team of incredible, life-saving security officers at Father Joe’s Villages.